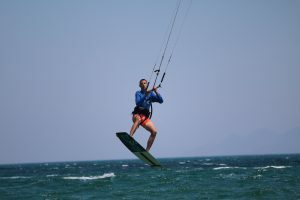 Chapter Greece – Nomad Kite Tour 2017 is a web series that shows our trip in Greece on 5 different kitesurfing places. The Episode 5 is created at Limnos. Visiting Limnos was part of our original plan. We just decided in Lefkada to make a broader journey and visit 3 extra spots (Flatland, Cape Drepano, Raches). Finally, on the 1st August we were ready to board on the ferry and depart for the island. It is still not crowded. The ferry is cheap (read more below). There are different spots to visit. Wild camping is possible on different spots. Several Hungarians are camping there. Ferries can be late by more than 5 hours. Different ways to buy tickets at different prices. Basic ticket is 17 EUR / person. For this price you can sit anywhere you find a place, but since you will be parking your car, passengers without cars will take the best places. I prefer to find an empty corner, and take my sleeping bag, so I can rest. Most ferries go during the night (4 hour ride). Be careful, sometimes when you buy the ticket last minute you won’t find it for 17 EUR but 27 EUR. Then there is nothing to do. If you are travelling during the day, take some beer with you, sit on the deck, and enjoy the view. This is Greece… you can do everything. The woods provide shadow and it blocks the wind perfectly. 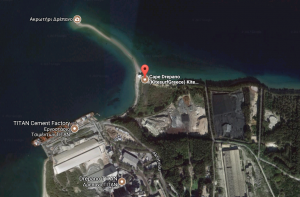 The Fiki-fiki beach bar is quite close by walk. You can use 2 toilets also (don’t expect to be nice ones). After waking up we met Krissz and Tomi (not me). We didn’t know them before but that was just the beginning of a beautiful friendship. Since we got robbed close to Flatland we contacted Hungarians if someone is coming to Limnos in during those days. Sebi suggested us to contact Krissz, so they could bring us some stuff that was stolen (phone, clothes). If you won the lottery buy this place and make it rise again. Meanwhile other Hungarian campers also arrived, like the family of Sebi, Windy, Zsolti, Medve, Bogyó and Laci. Later we also explored the other spots of he island. In Limnos you can visit different spots, some of them are huge. This time the way the wind was surprisingly weak. We spent 11 days on the island. 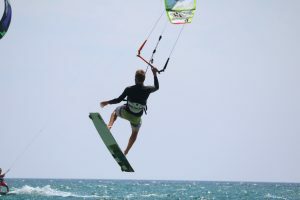 There were 3 days without proper wind and 3-4 days besides when I was using my 12m instead of 9m. 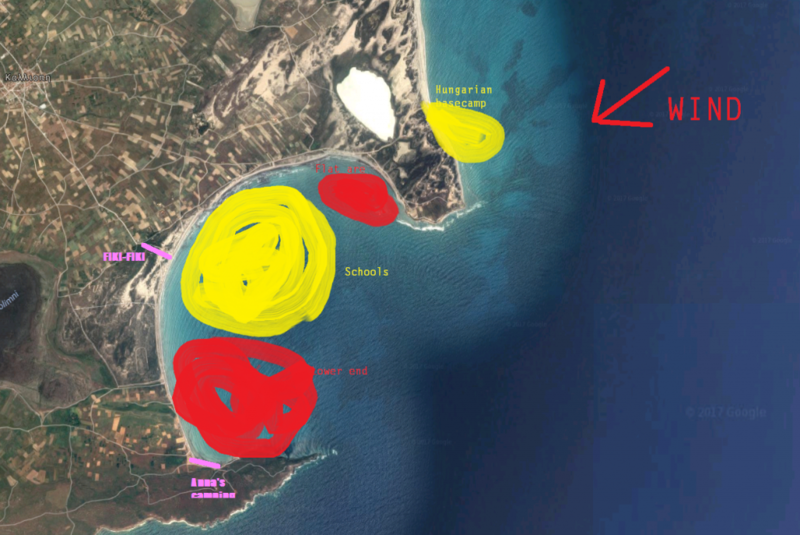 Hungarian basecamp (upper yellow): Wind is perhaps the strongest, choppy water. Not gusty. Not crowded. Flat area (upper red): the wind is terrible on this spot. Forget to have a good session here. 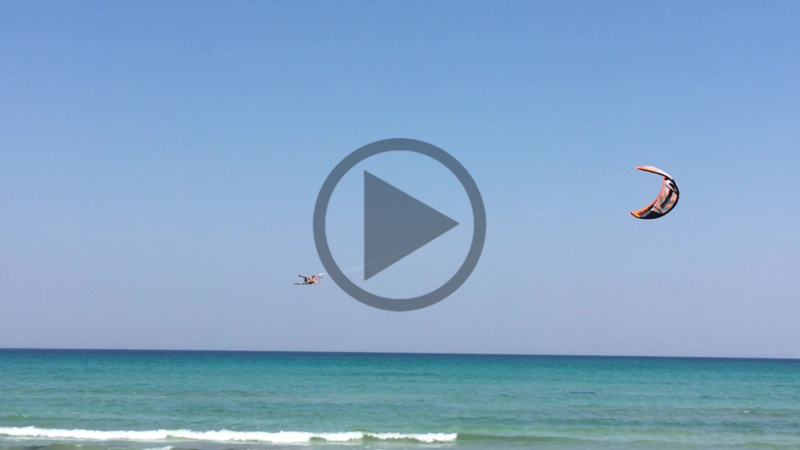 Check out short video from last year. Schools: (lower yellow): Choopy water, wind isn’t steady. Schools will argue. Lower end (lower red): Wind becomes steady again. Long waves are formed. Not crowded. But be careful, the police often comes here. It is prohibited to kite close to the buoys that surround the area for swimmers. As I know they don’t punish, just talk with you. Olivér was taken by the police for an hour on his 18th birthday. He said they were just chilling. 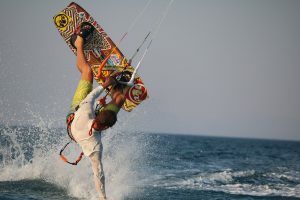 If you have a chance do the downwinder, go for it. We did it several times, as we got lifts from friends. These were awesome. From Fiki-fiki close to the shore you can catch some gusts / thermal eddies/ whatever UFOs. It can boost you surprisingly high, and you got the feeling, that it never puts you down. Kornél had a really big one. This year I didn’t like it. Only the really strong wind was strong enough here. It was also gusty. Last year I crated a video here performing my first kiteloops. The wave spot. This year we didn’t visit it since it also works only in strong wind. Check out last year’s video about it. 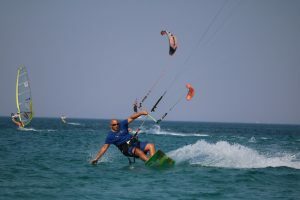 About some more places to kite read last year’s article. We had lot of fun with Krissz and Tomi when it wasn’t windy. 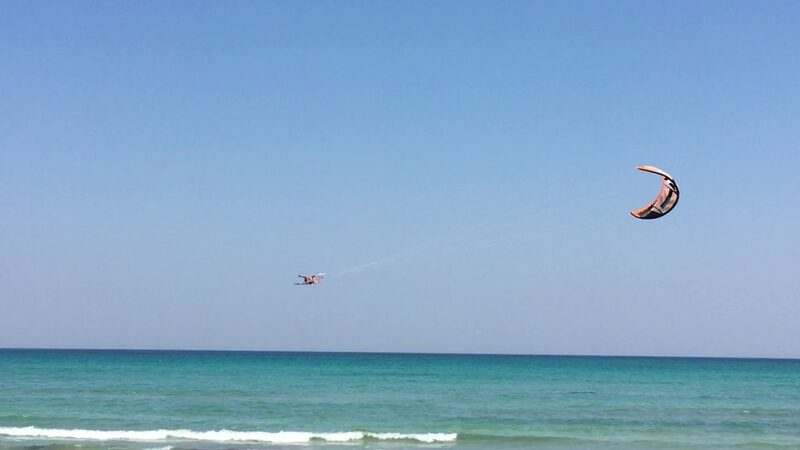 And we flew each other with a strong rope and a kite. It is possible to some snorkeling too. Krisz also took a bicycle with him. He said there were nice routes to ride. Also the beer was very tasty on these days. Especially the ones Krissz and Tomi brought with them from home (for us). Almost every 2nd evening there is a beach party in one of the beach bars. During August there is a festival as well called: Redeem. Saturdays you can visit Scarla bar. Fridays are Greek nights, we didn’t really like it. Go early to the Hungarian base camp. Have a big air session. Go back for an airstyle session. Finish it with a downwinder. Have some beers and lunch with Krissz and Tomi. Windy took some nice photographs of us while riding up there. After spending almost 2 weeks in Limnos we finally had to go home. It also meant the end of the tour (Chapter Greece). We really became nomads by the end of the tour. 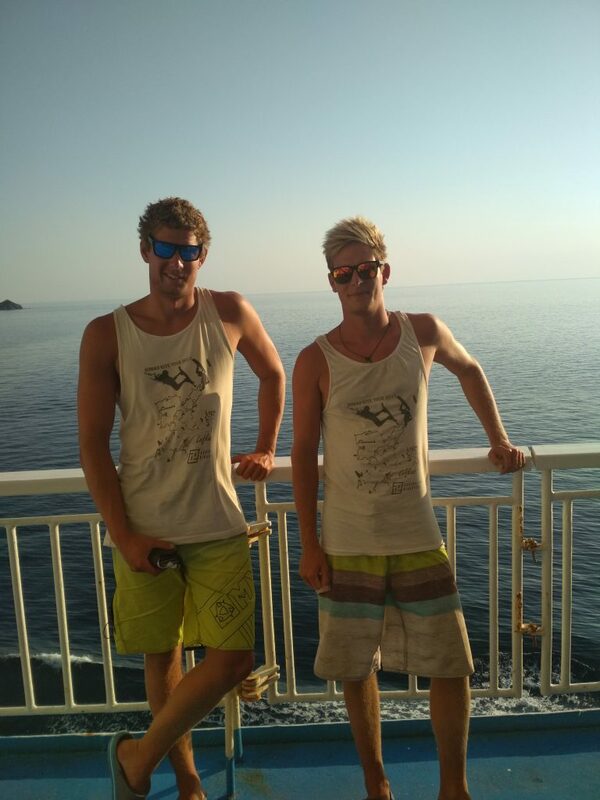 With Kornél we became like bros. About 30 people asked us during the trip if we were brothers. 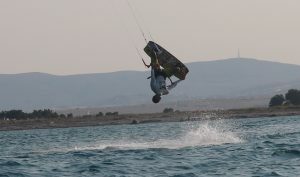 We created short video about Limnos, but we can’t show too much kiting, since we didn’t take videos a lot. Sorry we haven’t learn to be surf-kiters, yet. 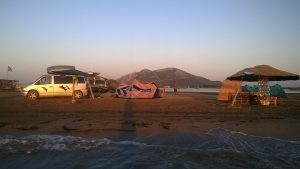 but we’re coming at Limnos this August, and want to have wild camping adventure with 3 children. We have tent and the car. It’s not 4×4 but it’s all that we have to come. Now, I must say that we need some help for spots for the campground. Actually, we’re interested for “ejoying the view”. We like wind, that’s not a problem. – In the woods many people setting up tents.